Home › Black-crowned night heron › Northern pintail - Anas acuta. The northern pintail (Anas acuta) is a dabbling duck belonging to the family Anatidae. 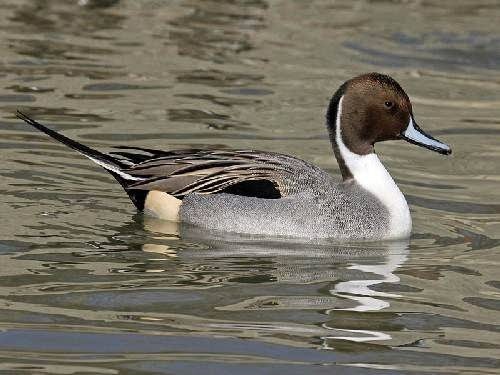 The northern pintail is distributed in northern Asia, Indian Subcontinent, Africa, Europe and Americas. The northern pintail is closely related to yellow-billed pintail (A. georgica) and Eaton's pintail (A. eatoni). The northern pintail ducks are large birds and the males measure, 50 to 65 in length and weigh 850 to 1,000 grams. The females are smaller and weigh 730 to 650 grams. The wingspan is 80 to 95 cm. The central tail feathers in the male are pointed and elongated, giving rise to the name pintail. The male has white stripe running from the back of the head down its neck. The head of male pintail is chocolate-coloured and the undercarriage is mostly white. The underside of the tail is black. The male bird has attractive grey, brown and black patterns on its back and sides. The females make a coarse quack call and the male vocal call is a soft 'geeeee' or 'proop-proop' whistle. The northern pintail ducks inhabit wetlands, agricultural fields, flooded grasslands, lakesides, tundra, sheltered estuaries, marshes and lagoons. The northern pintail ducks feed on seeds, aquatic plants, tubers, roots, shoots and grains. The breeding birds feed on insects, crustaceans, molluscs and other aquatic invertebrates. They feed usually in the evening and night and rest during the day. The breeding season is from April to June. The nest is constructed on the ground, hidden in vegetation. Seven to nine eggs are laid by the female. The female incubates the eggs and take care of the young ones. Breeding populations occur in Nearctic and Palearctic regions in Europe, North America and North Asia. The wintering pintail ducks move to Africa, South America and South and East Asia, including Indian Subcontinent. The northern pintail species are strongly migratory, especially in their northern range. These birds may be sedentary in some places in the Southern Hemisphere. For wintering these species move southwards. The total population of these northern pintail ducks is estimated to number 5,300,000 to 5,400,000 individuals. Habitat loss due human activity is the main threat. Wetland drainage, coastal petroleum pollution and agricultural pesticides are having effect on the populations. The IUCN (International Union for Conservation of Nature) has categorized and evaluated these northern pintail species and has listed them as of "Least Concern". Current topic in Birds of India: Northern pintail - Anas acuta.